The polished-brass finished dial features cast corner and center ornaments and a moon arch with an astrological blue moon phase. The dial includes a silver chapter ring with applied polished brass Arabic numerals. The dial is specially inscribed with “Presidential Collection” in the hemispheres of the moon phase. Adjustable Grandfather levelers under all four corners level the clock on uneven and carpeted surfaces. 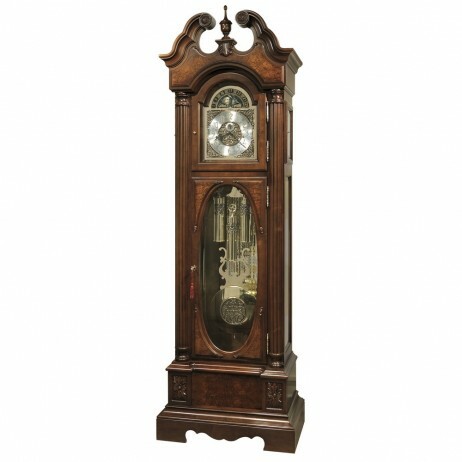 The graceful style of the Nottingham Grandfather Clock is emphasized by the elegant swan neck pediment with a turned, urn finial and shell embossing. 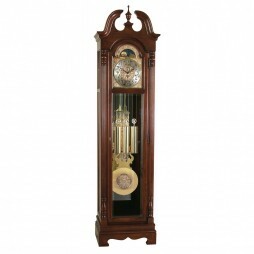 The dial, finished in polished brass, offers an ornate, gold tone center and a silver tone chapter ring. The dial is further enhanced with a simulated midnight blue moon phase. 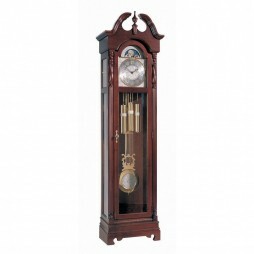 The ornate brass pendulum is accented by an illuminated case and glass mirrored back and base. 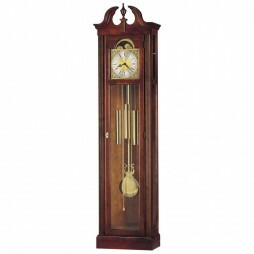 The quartz, dual chime movement plays Westminster or Ave Maria chimes and have both volume control and an automatic nighttime shut-off option. The cabinet is finished in Windsor Cherry on select hardwoods and veneers. 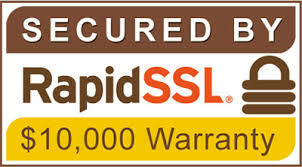 A brass engraving plate is available for an additional charge. 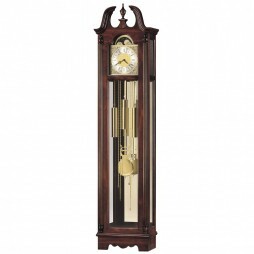 Stylish in looks and highly competent, the Howard Miller Chateau Grandmother Floor Clock will be the best addition to your room. It is finished in Windsor Cherry with a graceful swan neck pediment with turned finial and reeded finial seat. Glass side windows with a front door glass exposing the polished brass pendulum. This clock is wound once a week by raising the weights by pulling each of the three chains down that pull up the corresponding weight to its side.